It is common among ballet dancers, runners and baseball catchers. Sesamoids act like pulleys. They provide a smooth surface over which the tendons slide, thus increasing the ability of the tendons to transmit muscle forces. The sesamoids in the forefoot also assist with weightbearing and help elevate the bones of the great toe. Like other bones, sesamoids can break (fracture). Additionally, the tendons surrounding the sesamoids can become irritated or inflamed. 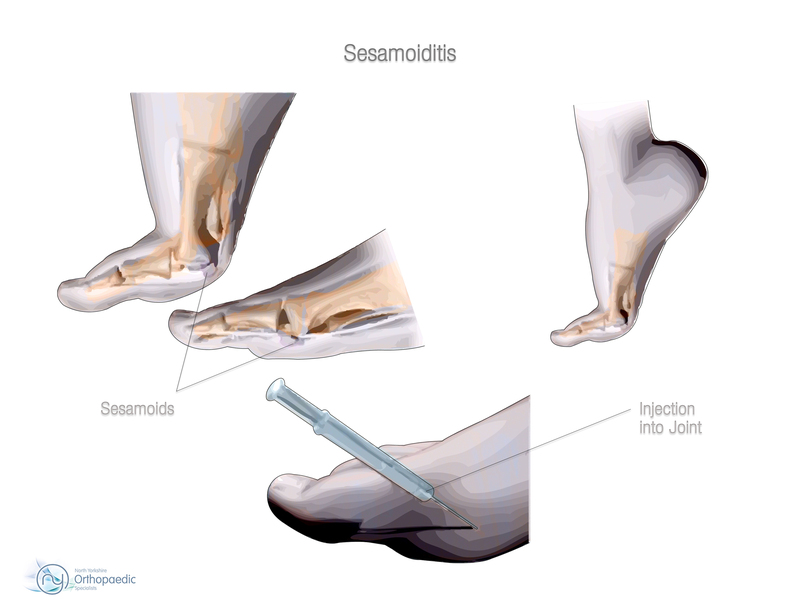 This is called sesamoiditis and is a form of tendinitis. During the examination, the physician will look for tenderness at the sesamoid bones. Your consultant may manipulate the bone slightly or ask you to bend and straighten the toe. He or she may also bend the great toe up toward the top of the foot to see if the pain intensifies. Your consultant may recommend an injection of a steroid medication to reduce swelling. The surgical procedure will vary according to the injury. The aim of surgery is to repair the soft tissues and restore the MTP joint motion so that normal function can be preserved. Your consultant may recommend removing part or all of the sesamoid bone. When bone is removed from only one sesamoid, the other sesamoid bone can still provide a fulcrum point for the toe flexors. However, if both of the bones are taken out, the toe flexors lose necessary leverage and can't function. When this happens, the big toe will either bend up like a claw or slant severely toward the second toe. Thus, taking both sesamoids out is usually avoided. When a sesamoid bone is fractured in a sudden injury, surgery may be done to remove the broken pieces. To remove the sesamoid on the inside edge of the foot, an incision is made along the side of the big toe. The soft tissue is separated, taking care not to damage the nerve that runs along the inside edge of the big toe. The soft tissues enclosing the sesamoid are opened, and bone is removed. The tissues next to the sesamoid are stitched up. Then the soft tissues are laid back in place, and the skin is sewed together. Surgery is similar for the sesamoid closer to the middle of the foot. The only difference is that the incision is made either on the bottom of the big toe or in the web space between the big toe and the second toe. For patients diagnosed with stubborn plantar keratosis, consultants generally perform surgery to scrape off the extra tissue. Your consultant may decide to shave off only the affected part of the bone. The bottom half of the sesamoid is cut off, and the rough edges of the remaining part of the bone are filed with a special tool to leave a smooth shell. This surgery is easier on the body than procedures that completely remove the sesamoid. After a surgical procedure to shave or remove bone, patients are generally placed in either a rigid-soled shoe or a cast for two to three weeks. Most are instructed to use crutches and to limit the weight they put on the foot during this period. In the majority of cases, you will able to walk with the aid of crutches within 2-4 days but you will remain somewhat limited for the first 2 weeks. However, if the surgical incision is on the sole of the foot, you will not be able to walk on this area for 3 weeks. This is to minimise the problems with scarring as this could result in discomfort and hard skin formation for the rest of your life. Some patients are able to return to wider shoes within two weeks and most are generally back into shoes by 4-6 weeks. Swelling generally starts to reduce at 6-8 weeks and the foot will be beginning to feel more normal at 3 months although the healing process continues for 1year. When you feel able to perform an emergency stop. This is generally between 4-8 weeks post operatively but you should always check with your insurance company first. If you are able to get a lift and have a job that is not active and you can elevate your foot, you may be able to return after 1-2 weeks. Generally, patients return to work between 4-8 weeks depending on the type of job, activity levels and response to surgery. Although the healing process continues for up to 1 year, you should be able to return to impact type activity at around 2-3 months. This will depend on the type of operation you need and how you respond to surgery. Overall 98% of patients are happy with the result, however pain an stiffness might occur the days after the surgery. You may get discomfort in other parts of your foot during the recovery period. This generally settles.